Of all the criticisms one could level at Alejandro Amenabar's Agora, having its heart in the wrong place isn't one of them. It will happen, of course, with a subject as potentially controversial and inflammatory as this, but Agora is nothing if not well intentioned. The problem is that for such a potentially incendiary topic, the film is surprisingly dry and devoid of passion. There is no denying that it is a powerful story, made even more so by the fact that it is a true one. 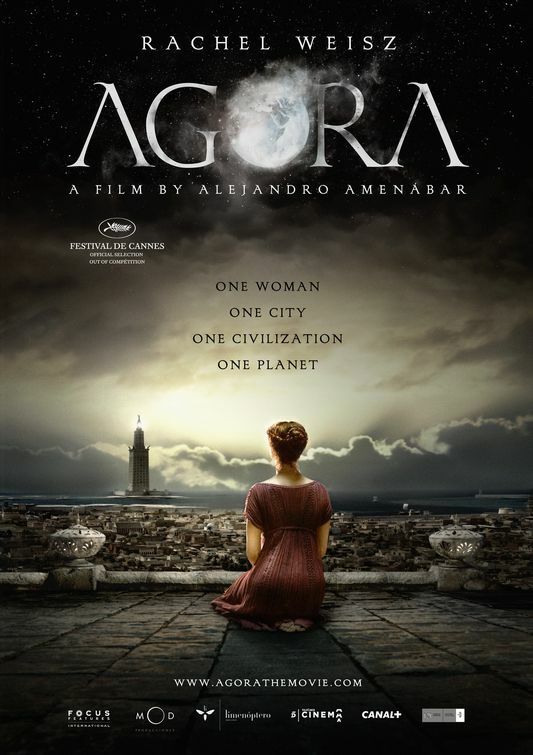 Agora tells the story of Hypatia (Rachel Weiss), the noted female philosopher and astronomer of ancient Alexandria, whose theories of a heliocentric solar system and elliptical orbits ran her afoul of the Christian authorities, that took over the city and destroyed its massive library in the 4th century, AD. 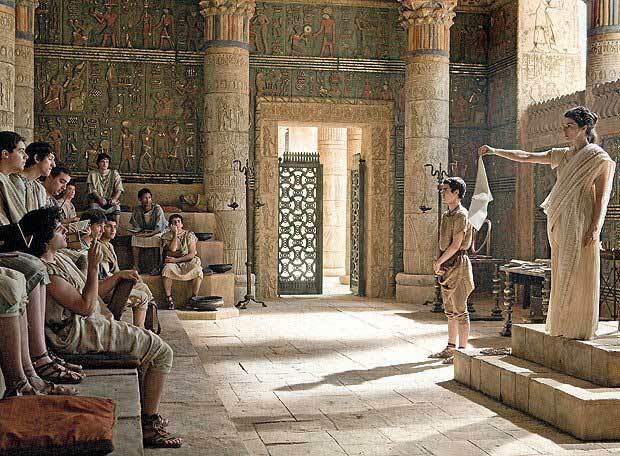 Once a popular and widely respected teacher, Hypatia finds herself on the outside of Alexandria's society, as she refuses to give into the new Christian leadership's demands that everyone profess their religion. 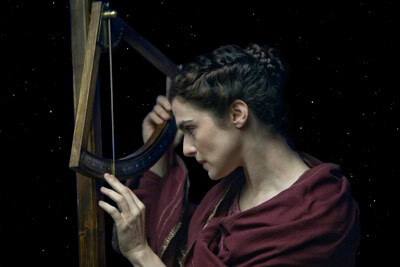 Hypatia, a woman of science, holds true to beliefs, which eventually leads to her execution for heresy. Strangely, and perhaps most sadly, it is still a story that is relevant today, as the battle between science and religion rages on. Yet instead of channeling the fervor often surrounding the debate, Agora admirably keeps a calm head. It is, by its very nature, emotionally distant and rational, but it is often to dry and cerebral for its own good. It is a left-brained idea in a right-brained medium, and while there is something to be said for that, one can't help but wish that the film contained some kind of emotional fire or passion for its subject, rather than just a dry history lesson. This is the kind of film that will one day become a staple in high school history and science classes, and as well it should. From a historical standpoint the film is a fascinating study. But as a piece of cinema, Agora is flat and often unforgivably dull, never passing escaping the period piece trap of feeling like a bunch of modern actors playing dress up. To circumvent its inherent lack of emotionalism, Amenabar inserts a love story between Hypatia and Davus (Max Minghella), a slave in her father's house who falls in love with her, only to run off and join the Christian hordes that eventually overrun the city. It is an unnecessary and ultimately pointless subplot that leads nowhere, and comes across like the awkward attempt to infuse the story with romance that it is. That isn't to say that there aren't flashes of the much better movie that Agora could have ultimately been. There are flashes of passion, beauty, and even wonder at the miracle of science scattered throughout the film that is just enough to make one long for more. But alas, it is not to be. It's just enough to show what the movie could have been had it not been so academic. It does feature a truly gorgeous, sweeping score by Oscar winning composer Dario Marianelli (Pride & Prejudice, Atonement), filled with soaring choirs and massive crescendos. Had the film shown the same kind of epic emotional fervor as its music it would have been a great film indeed. However, as it it stand, Agora is little more than a history lesson dressed up to look pretty. But it never feels wholly real or immersive. It keeps its audience at arms length, stubbornly refusing to let us get close to the characters. They remain little more than what they were before, mythical figures of history with all the depth of a page from a history book. There's a great film in here somewhere, but for now it remains buried beneath the sands of time. AGORA; Directed by Alejandro Amenabar; Stars Rachel Weiss, Max Minghella, Oscar Isaac, Ashraf Barhom, Michael Lonsdale, Rupert Evans; Not Rated; Now playing in select theaters. A very thoughtful review of the film. I saw the movie this past weekend and agree that it has pacing problems and Amenabar missed the historical point (and distorted a lot of history in service to his art - which is fine as long as people don't take the movie for fact.) He was using this piece as an indictment against all fanaticism. For those who want to learn more about the life of Hypatia, there is an excellent (readable) biography by Maria Dzielska titled "Hypatia of Alexandria" published by Harvard University Press (1995.) I also have a series of essays on the historical events and characters depicted in the movie on my blog (http://faithljustice.wordpress.com/) - not a review of the film, just a "history behind the movie."